I am a strong believer that children should give gifts to others. No, I’m not saying that they have to save up their pocket money to purchase gifts, but that they should make something with love and care that can be shared with the people who they care the most about. So I always come up with some new holiday craft that they can make for others at Christmas. This year I decided to finally get back to the American tradition of sending Christmas cards, and wanted to think of a simple craft for the kids to make that could easily fit in an envelope, something lightweight and not bulky. 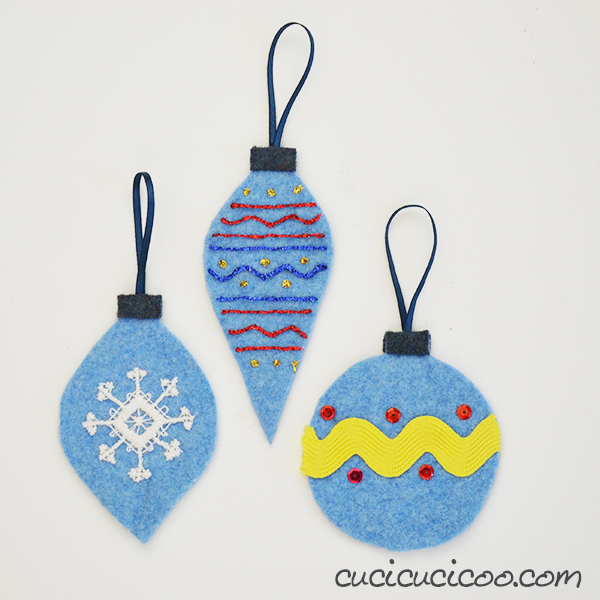 And seeing as I’ve been working a lot with boiled wool from felted sweaters, I came up with these DIY felt Christmas tree ornaments for kids to decorate! 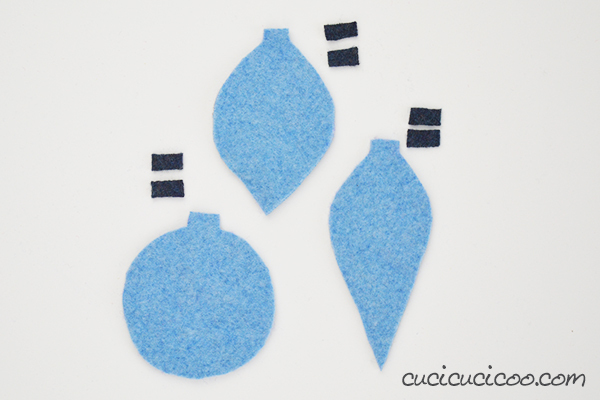 Today I have a free pattern for you to cut out three different ornament shapes. 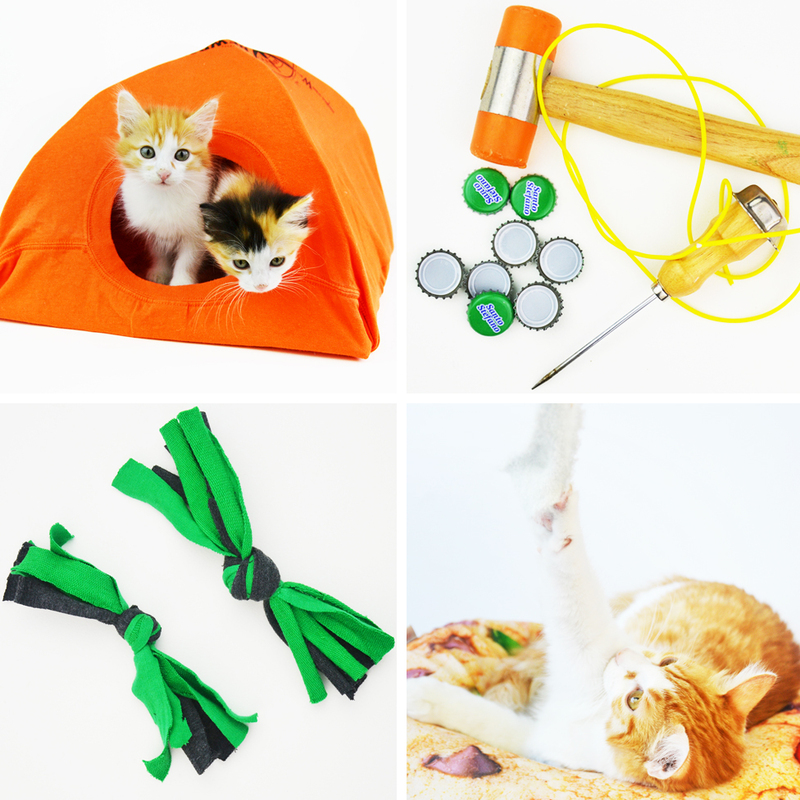 All you have to do is cut them out and give your kids a bunch of decorating supplies, and you’ll be amazed at how much creativity comes out of them! They came up with ideas that never would’ve occurred to me and they were so proud of their creations. This is just a small selection of the ornaments that they created. 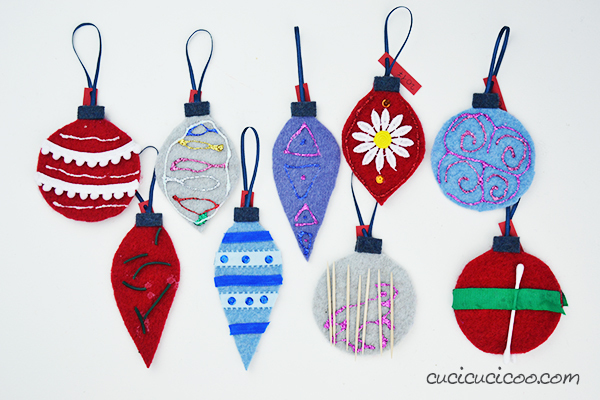 If you don’t have children to create these ornaments with, but you do have children in your life to give gifts to, why not give them the gift of creativity? 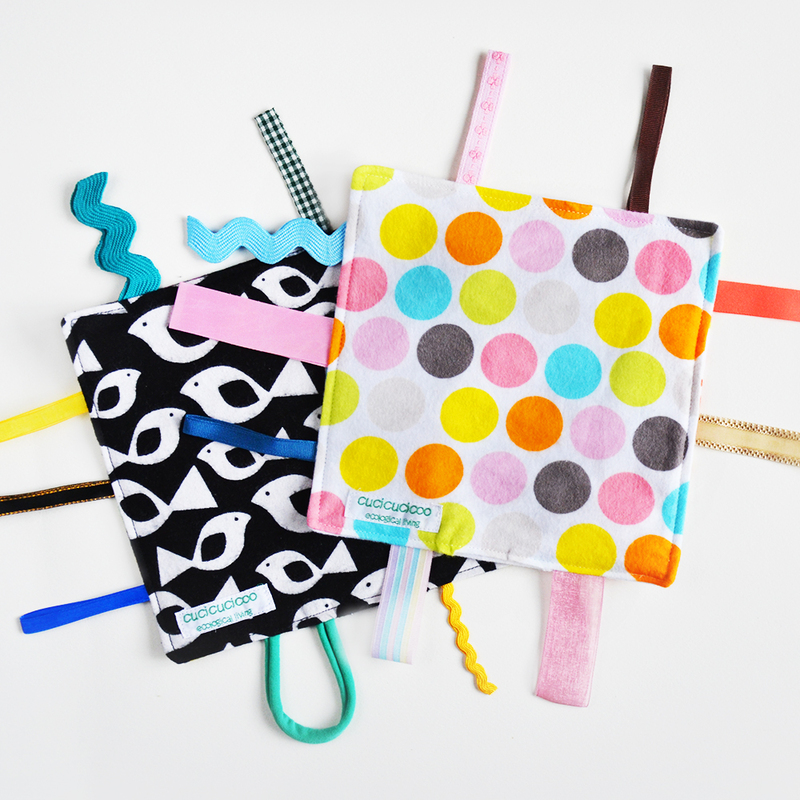 It’s really easy to just prepare the materials in a cute little package for giving! 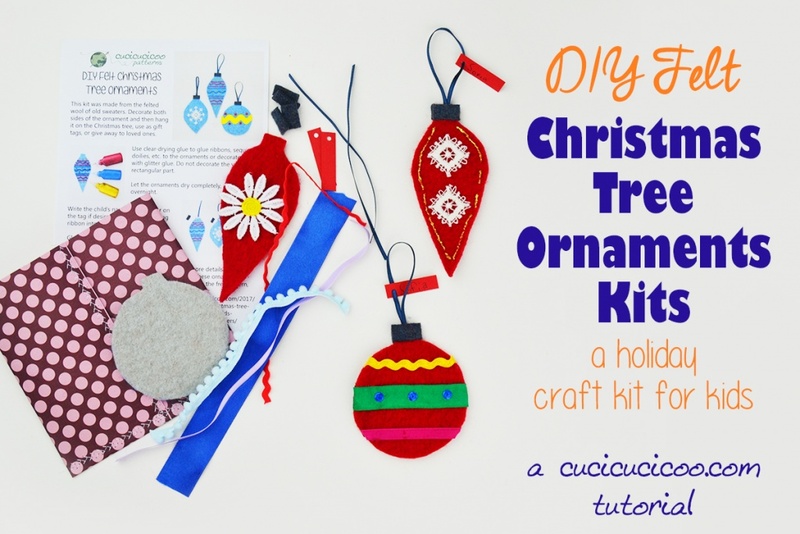 Get the tutorial for DIY Christmas Ornament Kits for kids here! 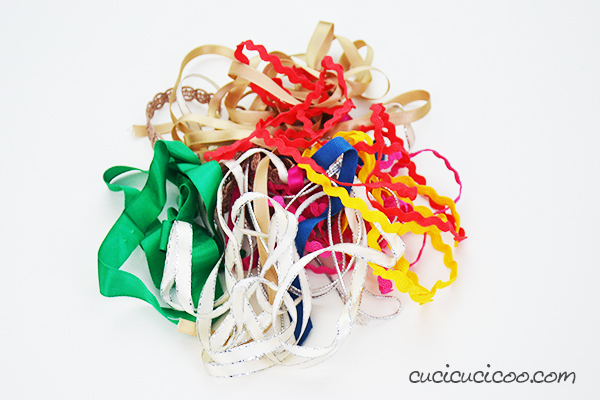 Of course, you probably won’t want to let your children loose in your crafting supply stash, so choose some ribbons, sequins, pompoms, and so on that you don’t mind them cutting into pieces. 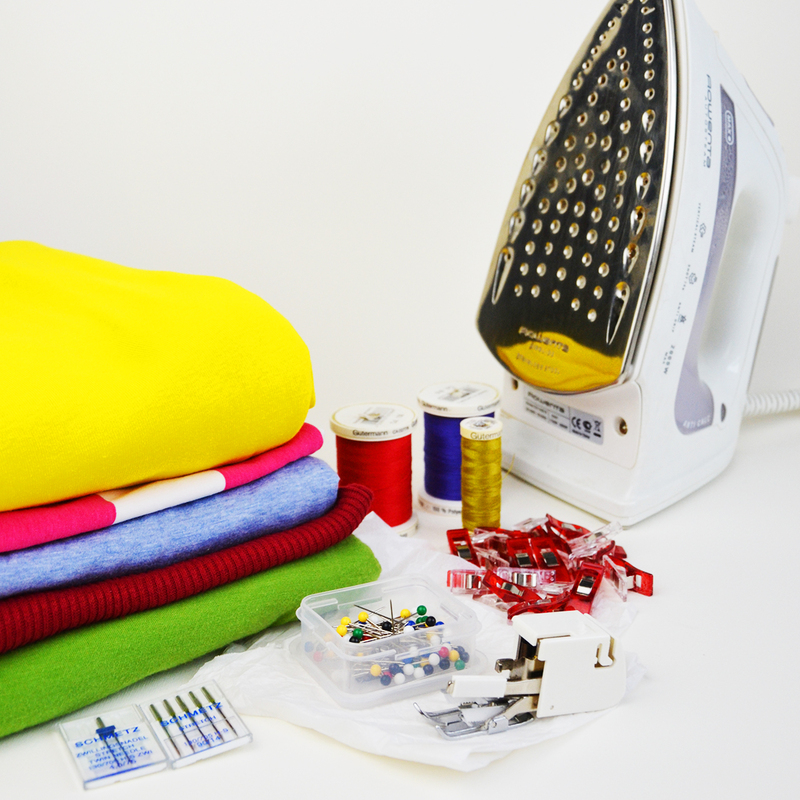 This is a great way to use up extra bits that you have leftover from other projects! 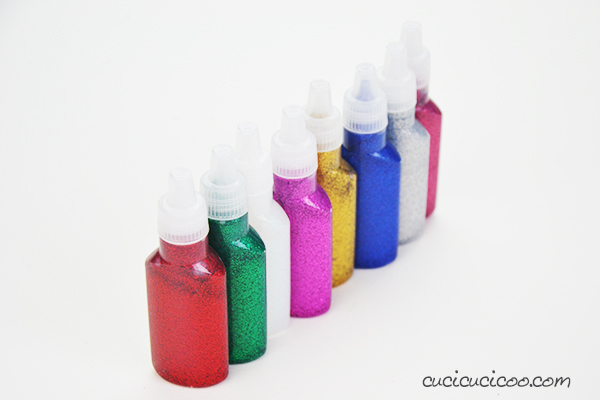 Oh, and glitter glue! 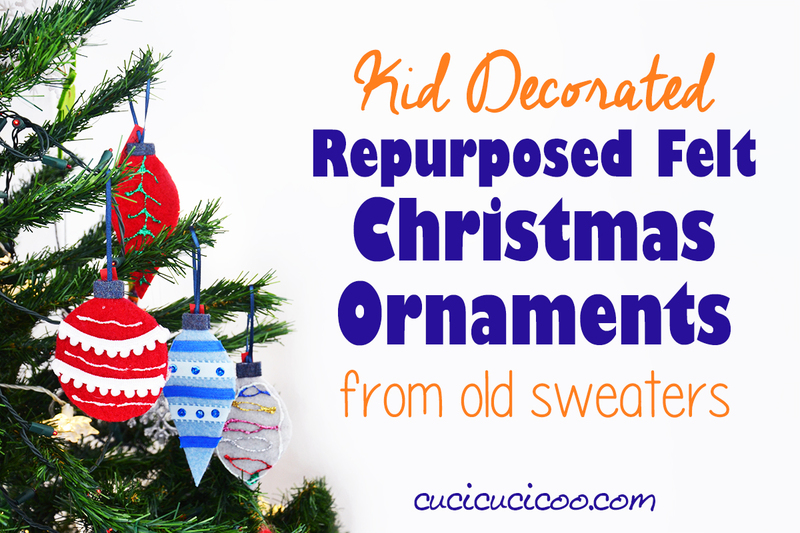 Such an easy way to decorate and add festive shine and joy to the project! 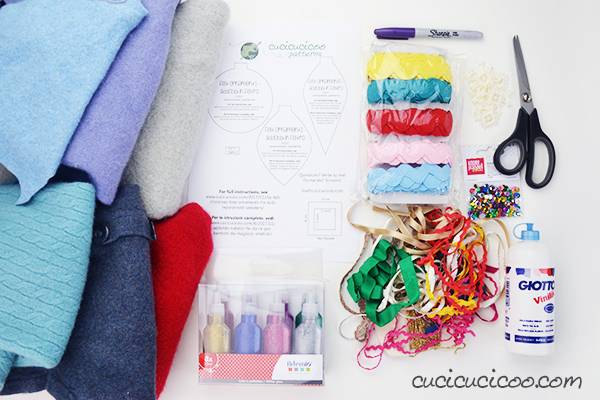 You probably already have everything you need for this project, so gather some old sweaters, choose some supplies, and let’s get started preparing these DIY felt Christmas tree ornaments for kids! Ribbon, ric-rac, yarn, pompom trim (we used this mini pompom trim*), etc. Sequins, pompoms, small doilies, etc. 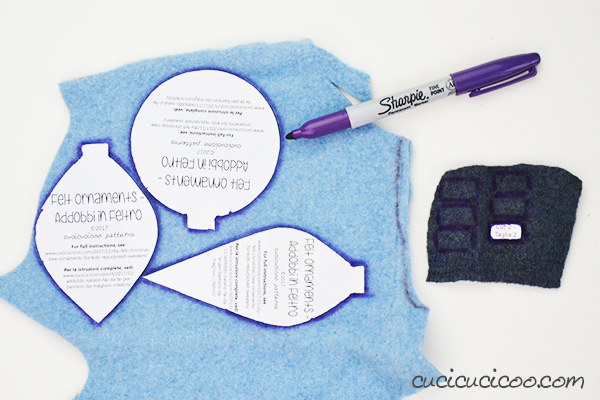 Before you start, make sure you’ve completely felted your wool sweaters according to the directions in this post. 1. 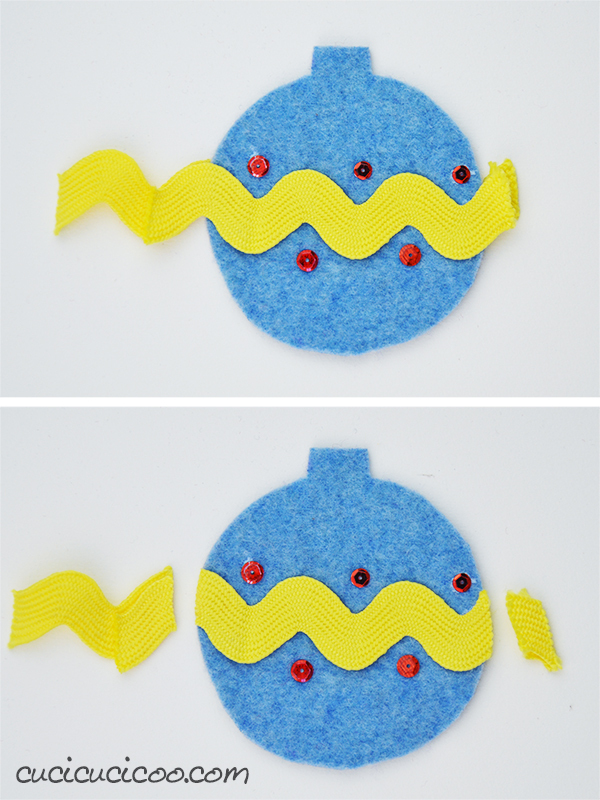 Print out the ornament template (download it here from my free downloads page), glue it to a discarded cereal box or something somewhat rigid, and cut it out. 2. 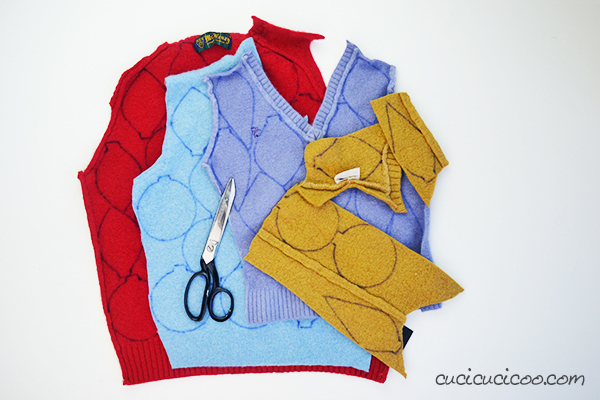 Trace around the pieces onto the felted wool sweater with a Sharpie or other permanent marker. Note that you need two rectangular cap pieces per ornament. 3. Cut out the pieces, making sure to trim off all bits with the marker on them. Now comes the most fun part! 4. There’s not much to say here. Just decorate them! 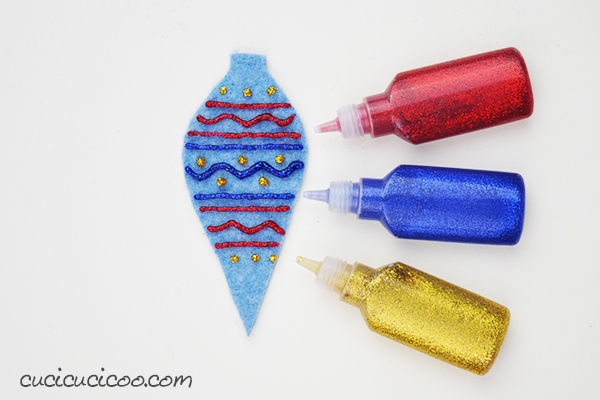 You might want to start out with simple designs (lines, zig zags, dots) with glitter glue. Then the kids will start getting a bunch of their own ideas. Do NOT decorate the top rectangular part of the ornaments, as that will get covered. I suggest that you decorate just one side with glitter glue and let it dry overnight before decorating the second side. 5. 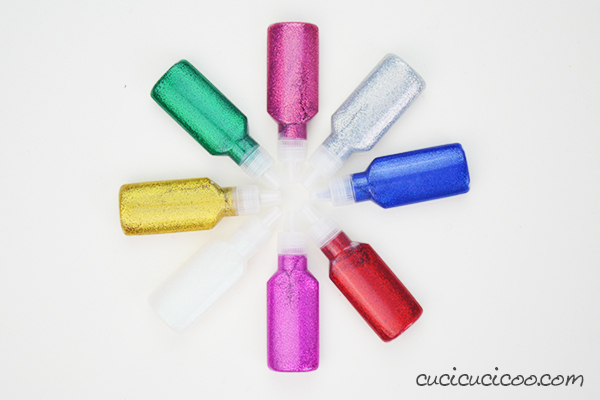 Pour some glue in an empty plastic container and give the kids toothpicks or Q-tips to apply it to ribbons, sequins and whatever else they want to glue on. 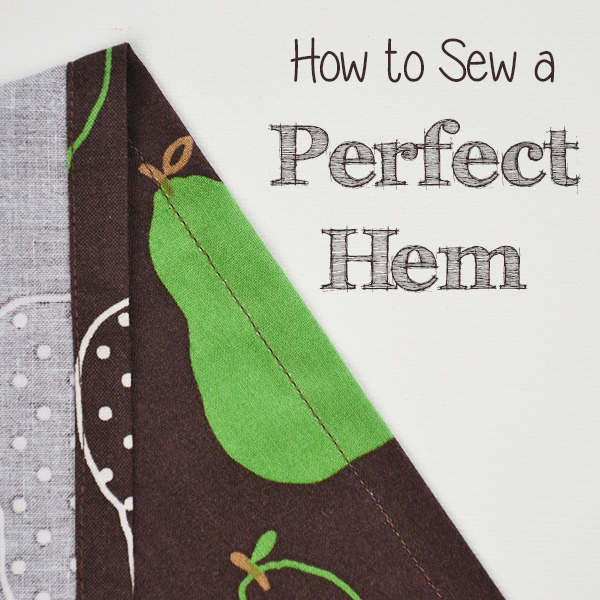 In the case of ribbon or ric rac, I suggest using a longer piece than necessary, and then trimming it off after it’s dried. 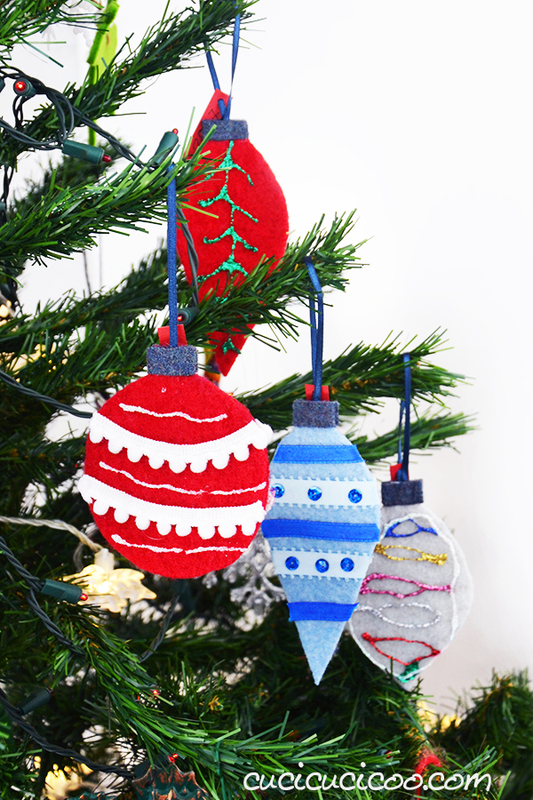 If you’ve inherited a great aunt’s handmade doily collection, the little ones make great decorations for the ornaments. These ones look like snowflakes and my kids loved them! Let the ornaments dry completely before continuing. 8. Spread glue on the rest of that second rectangular area and press the other cap piece on it. 9. Let the glue dry completely. I suggest using a clothespin to keep the top part pressed together or to put it under a heavy book for a little while. Wasn’t that easy? 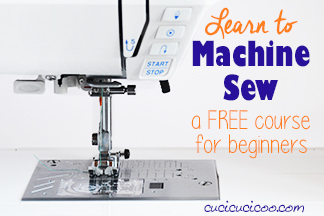 What a wonderful no-cost, scrap-busting, and eco-friendly craft and gift, right?! Ok, I’ll admit that I made those three ornaments in the pictures above, just to test everything out first. But then I let my kids go wild and make a ton of them. And they loved it! 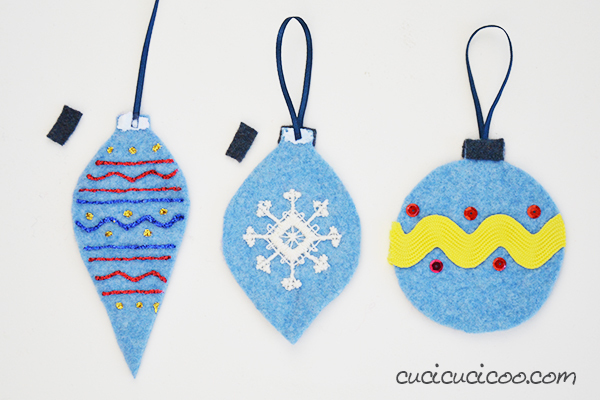 Here are my suggestions if you plan to make a lot of these ornaments with kids to give away. Trace out a whole bunch of pieces and then cut them out all at once. 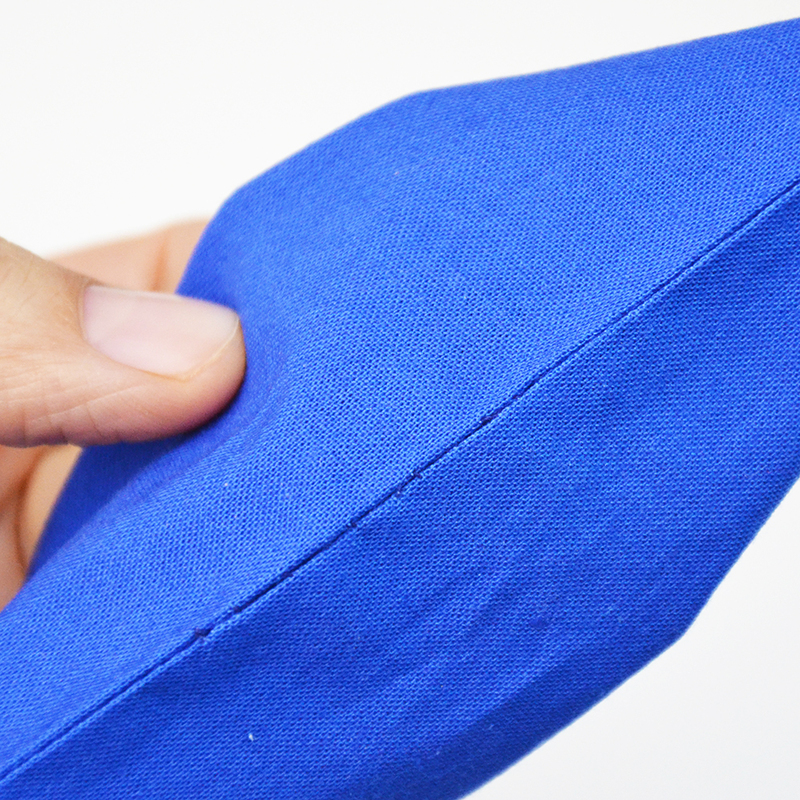 This will save you time and let you get the most out of the fabric. 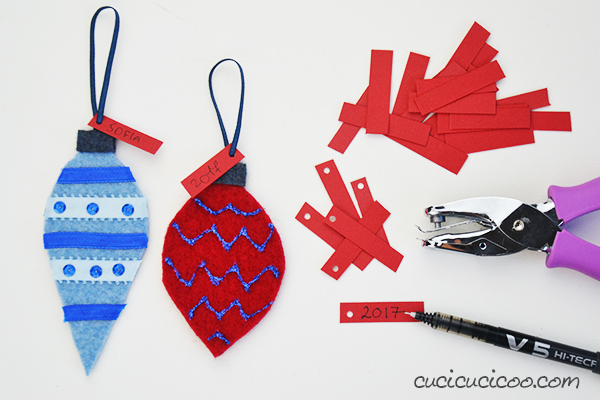 These are great keepsake gifts, so I like the idea of labelling the ornaments with the child’s name and the year the ornament was made. Just cut out little rectangles (mine were 1 x 4 cm), punch a hole in one end, and have the kids write their own labels if they know how to write. Then just slip the hanging ribbon through the label hole before gluing it on. Easy peasy. 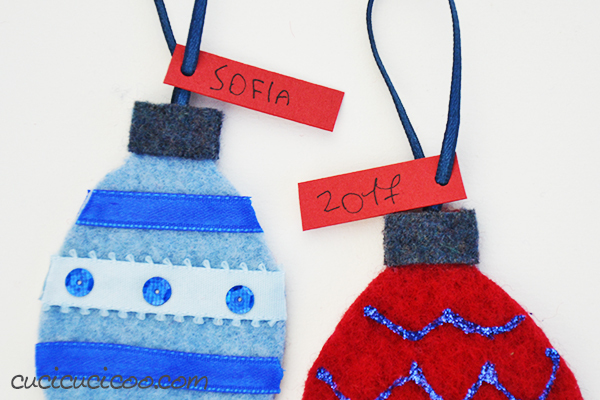 Years from now, we will be able to look back at these ornaments and know for sure that Sofia made them in 2017! When you’re preparing your holiday cards to send out to your loved ones, let your kids choose which ornaments they want to send to who. Mine were so excited to choose the ones that they thought each person would appreciate the most! And of course, make sure to keep a few for your own Christmas tree! I love having handmade ornaments to admire year after year and the children are so proud of seeing their work hanging for all to see! 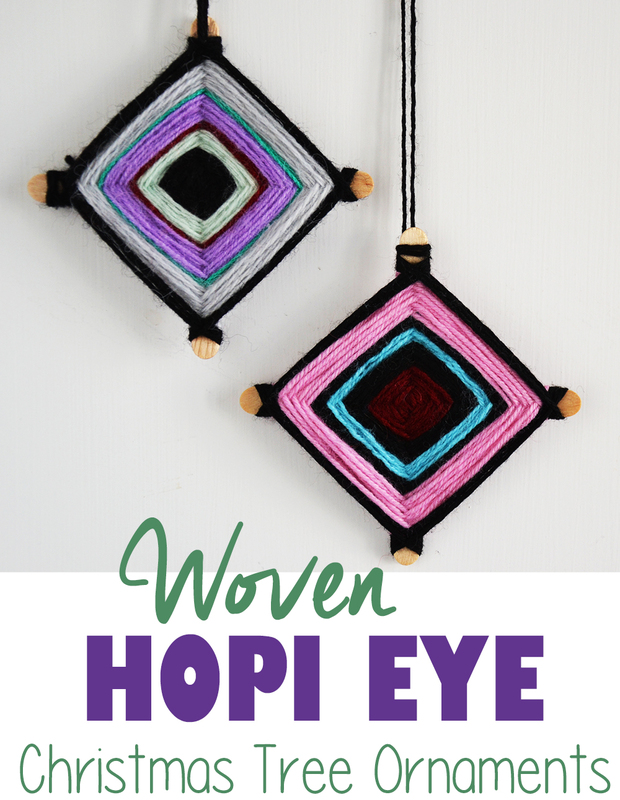 If you loved these DIY felt Christmas tree ornaments for kids, why not take a look at my Hopi Eye woven yarn ornaments, another fantastic crafty project for kids that is perfect for hanging on the tree? 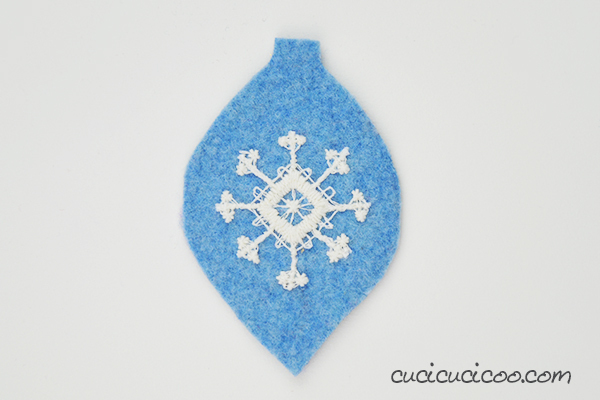 Don’t forget to Pin this tutorial for this or next holiday season! 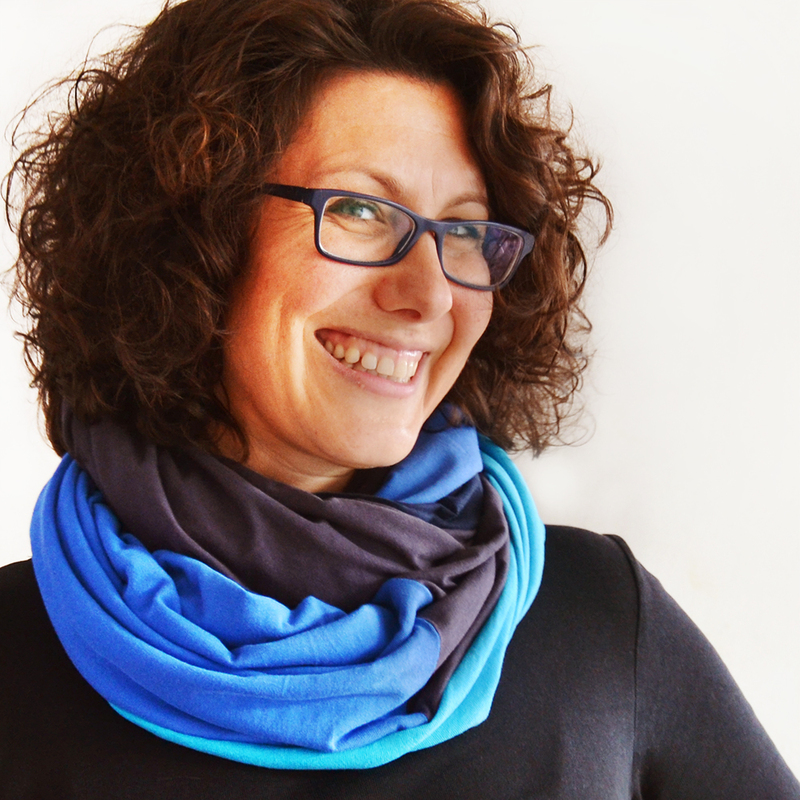 Grazie Enza! Ahaha! Hai ragione, che questo tipo di crafting è un motivo per non disperarsi quando si infeltrisce per sbaglio un maglione! In realtà proprio in questi giorni ho preso tre maglioni lavorati a maglia da mia suocera tanti anni fa che sono stati per errore infeltriti e li sto trasformando in qualcosa per poterli usare ancora! 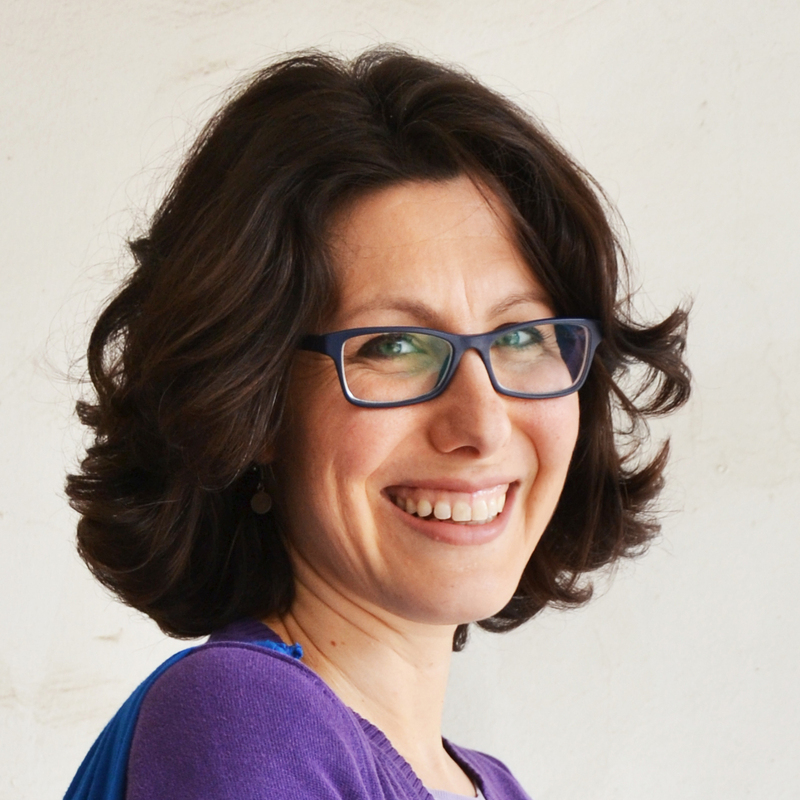 Buon Natale anche a te! 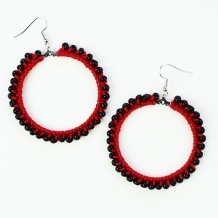 Your ornaments look fabulous I know I would love to receive one as a Christmas gift. 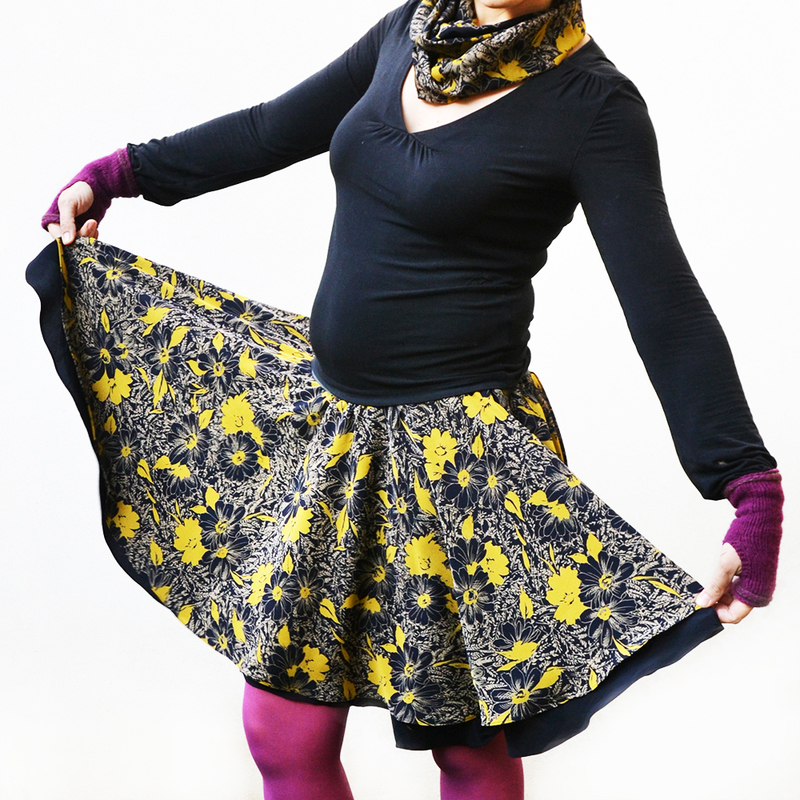 I also love that you used repurposed sweaters too. 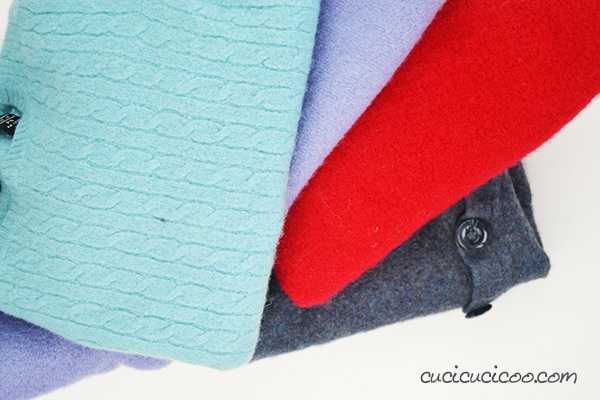 Those of us who use felted sweaters know that store-bought felt doesn’t even compare in loveliness, right?! Thanks for stopping by, Claire! 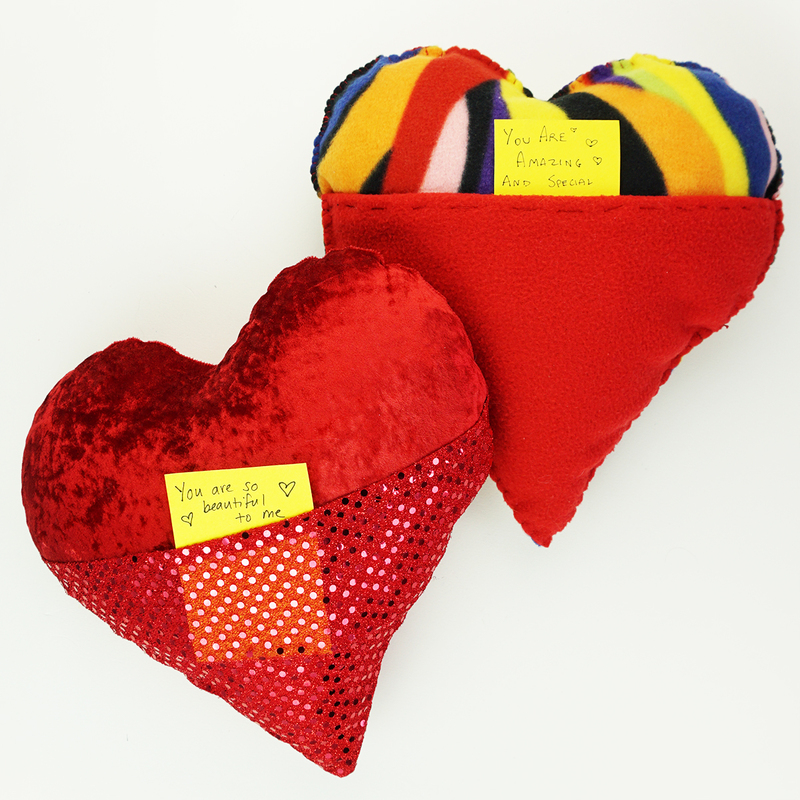 These are adorable and I love that you were able to repurpose something to make them. Thanks, Paula! I love teaching my kids through example that it’s more than possible to create using what we already have around us!